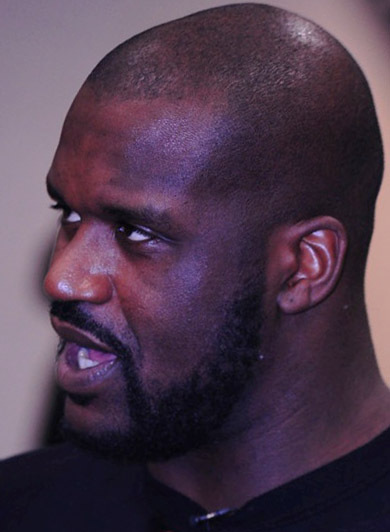 This strange NBA offseason keeps getting more surreal, with Shaquille O’Neal joining the Boston Celtics for the veteran’s minimum on a two-year deal. As a long-time Celtics fan, I’m not sure I had ever really given the idea of Shaq in a Celtics uniform much thought. I just assumed that it would never happen. Of course, if someone had tried to tell me in 2006 that the Boston Celtics 2010-2011 roster would include Kevin Garnett, Paul Pierce, Ray Allen, Jermaine O’Neal, and Shaquille O’Neal, I’d have died from a laughing fit. Shaq is certainly past his days of being a truly dominant game changer, and yet, I can’t help but feel that he still has something left to bring to the Celtics. Watching the Celtics get beaten up on the boards in Game 7 of the Finals back in June convinced me that without Kendrick Perkins – and possibly even with him – the Celtics simply lacked the size and bulk to deal with a front-line like the Lakers. Obviously, Shaq isn’t going back to the days of being the focal point of a team, but on the Celtics, he doesn’t have to be. He simply needs to provide some rebounding, points, and lane clogging defense off the bench. He can still do that, and a team could do much worse than having Shaq as an available option to play center for them. Will Shaq mean that the Celtics win the title next year? Obviously it would be foolish to make that assumption, and there are dangerous teams like Miami, the Lakers, and the Orlando Magic out there to get in the way. I do feel confident in suggesting that had the Celtics had Shaq and Jermaine O’Neal in June, they would likely have claimed the title rather than the Lakers, as a few rebounds would have made all the difference against a Lakers team that couldn’t seem to hit the broadside of a barn for most of game 7. Should be an interesting season next year, and the Celtics new Big “Shamrock” should only add to that. Win or lose, I’m at least looking forward to the show. Shaq rarely fails to entertain. For Celtics fans who were just discovering their love of basketball as Larry Bird’s career was winding down, our hopes came to rest on the slender shoulders of one Reggie Lewis. The lanky Lewis was born in Baltimore, Maryland. He played at legendary Dunbar High in Baltimore, but he played his college ball in Boston at Northeastern. So it only seemed fitting that the Boston Celtics made him their first round draft choice at 22nd overall in the 1987 draft, a mere year after the tragic death of Len Bias, the man who was supposed to serve as the bridge to future success as the careers of the original Big Three were winding down. After an uneventful rookie year in which he saw little playing time, Reggie exploded as the Celtics 6th man in his second year. He became an all around great player very quickly. With a silky smooth shooting touch, fundamental passing skills, and the ability to both block shots and steal the ball as a swingman, Reggie had game. 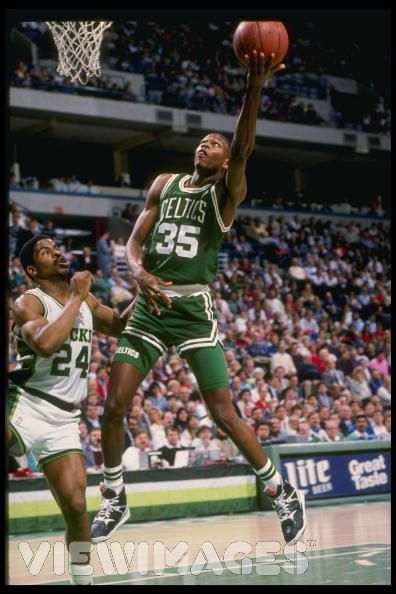 An Eastern Conference All Star in 1992, Reggie Lewis became the Captain of the Celtics after Bird’s retirement. Reggie Lewis was the future of the Celtics. Unfortunately, Reggie’s years in Celtic green proved too brief, as the Celtics were once again struck by tragedy. On April 29, 1993 Reggie Lewis collapsed while running the court at the Boston Garden during the first game of a first round playoff series against the Charlotte Hornets. Reggie Lewis never played another NBA game. I have no desire to rehash the medical drama that played out after Lewis collapsed. I understood at the time why Lewis wanted a second opinion, and I understand why the first team of doctors wanted no part of clearing him to play. I can forgive Dr. Gilbert Mudge for being human and wrong in his second opinion that suggested Lewis would be able to play again. Unfortunately, some times tragedies happen, and there is nothing anyone can do to stop them. I was in my parent’s basement watching television on the night of Tuesday, July 27, 1993 when a news flash announced that an NBA All Star had passed away. I knew immediately that it was Reggie Lewis. I could feel it. My worst suspicions were confirmed when the News came on and announced that Reggie Lewis had collapsed on a basketball court at Brandeis University in Waltham, Massachusetts. Reggie Lewis was dead, and for the first time as a young teenager, I began to truly understand the nature of tragedy. It comes without warning and it can strike down the best of us. All of the recriminations and speculation that followed both fascinated and pained me. Had Lewis used cocaine? Was there something that could have been done to prevent his tragic death? None of it matters really. We’ll never know how good Reggie Lewis could have been, and the Celtics suffered for years in the aftermath of his unexpected death. His wife and his two young children – one at the time still unborn – were the ones who really had to suffer the full force of his tragic death. My heart went out to them. Reggie Lewis died 17 years ago today. His number 35 is retired and hanging in the rafters of the new Boston Garden, and he will always have a place within the Celtic family. Our time watching Reggie play may have been too short, but what a time it was. Rest in peace, Reggie. Good to be the "King." Adrian Wojnarowski’s thought provoking article, State of LeBron: Live at 9, from his ego, illuminates exactly what’s gone wrong in the NBA under the watch of NBA Commissioner David Stern. The celebration of individual greatness has become an ode to the narcissistic young stars who are told how special they are from the moment their talent emerges, and lost in that sea of greed, ego, and excess is a sport that at its best can be an elegant celebration of the collective, a song to the power of the whole rather than the individual. Credit David Stern for growing the league in the aftermath of the Magic-Bird era, but make no mistake that his calculated efforts to push the admiration of great individual performances has poisoned the NBA. Great as Michael Jordan was, and as much as he saved the league in an hour of need, his legacy has now been twisted into one that tells the young superstars of today it’s okay for them to make it all about themselves. Cameras follow Chris Bosh around to record his free agency experience and LeBron James has the audacity to schedule an hour-long special on ESPN to announce his decision about where he will continue his basketball career. Perhaps the most amusing twist of all is that LeBron now looks as though he may sign in Miami to join Dwayne Wade and Bosh so that the three of them might unite for a championship. Apparently it takes more than a self-inflated ego to win the NBA’s ultimate prize. As a Celtics fan, I watch the circus that surrounds LeBron James and his cohorts, and I contrast it with the simple, quiet manner in which both Paul Pierce and Ray Allen resigned with the Boston Celtics. Maybe Pierce and Allen are over the hill. Maybe the Celtics window is closed. Whatever the truth of the matter, Pierce and Allen can finish their careers with dignity, knowing that their sacrifices for the greater good of the team brought them at least one championship and a chance at another. 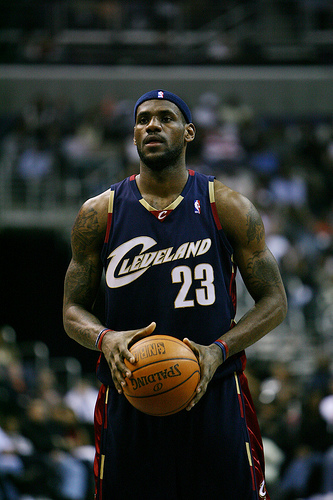 Here’s to hoping that maybe one day LeBron James can learn that its not just about it him. Maybe then he can truly be the King that he proclaims to be. While it’s certainly nice to see the esteemed Howard Bryant of ESPN agreeing with what I wrote about in my post “Why we should all be rooting for the Boston Celtics to win the NBA Championship,” I wanted to address something else after last night’s debacle in Orlando. Many people have dismissed the claims of disgraced NBA referee Tim Donaghy that NBA referees are part of a conspiracy to fix NBA playoff games. I put myself largely in that category, as Donaghy has an obvious reason to lie and a history of dishonesty. Yet, when I see things like what happened last night in Orlando, Donaghy’s claims nag at me. Let me add that I generally hate the blame the referee mentality that we often see in modern sports. Referees are human and fallible, and most of the time, I’m willing to chalk a bad call up to that. Where I start to wonder if Donaghy’s claims don’t hold some legitimacy is when it becomes quite clear that the refs are blatantly favoring one side or another, “missing” obvious calls, or calling one thing a foul when committed by one team and ignoring the same exact thing when the other team does it. I saw all three of these things last night in spades, and it leads me to believe that the refs were trying to make sure that the series between the Orlando Magic and Boston Celtics goes to six games. David Stern, let me be the next (I’m hardly the first) to tell you that your league now has a very serious image problem when it comes to officiating. Before I get into the disturbing events of last evening, let’s take a brief trip down memory lane to the pivotal game 6 in the 2002 Western Conference Finals between Stern’s precious darlings the Los Angeles Lakers and the Sacramento Kings. I remember watching the game at the time in complete disbelief at how much the referees did everything in their power to help the Lakers win the game and avoid being bounced from the playoffs by the smaller market Kings. I sat in stunned silence after the game ended, unable to believe what I had seen. The Lakers shot 27 free throws in the fourth quarter alone, and I remember Kobe Bryant blatantly getting away with one of the most vicious and egregious hatchet jobs in the history of sports as he shoved and elbowed Mike Bibby, committing a clear foul directly in front of a ref who pretended he saw nothing. Worse, the refs then had the audacity to call Bibby for a foul on Bryant. The officiating of that game was so atrocious, that consumer advocate Ralph Nader called for an investigation. This game was at the heart of Donaghy’s argument about the NBA fixing games, and give the man credit where it is due, he picked the right game to point to. To this day, I feel that the Sacramento Kings were jobbed out of a chance to go to the Finals and I don’t consider the Lakers 2002 Championship legitimate. I don’t know how anyone but a Lakers fan could. With that history noted, it brings me to last night’s game between the Celtics and the Magic. I had a very bad feeling when early on the referees ignored the text book example of an offensive foul when Dwight Howard led with his elbow as he bowled over a planted Paul Pierce. Elbows and Dwight Howard have become a theme, but the NBA doesn’t seem to want to acknowledge it. The night only got worse for the Celtics from there. Any time Kendrick Perkins or Rasheed Wallace so much as brushed Dwight Howard gently, they were called for fouls, while Howard’s flailing elbows never seemed a problem, not even when he knocked Glen “Big Baby” Davis into a concussed state. Then of course there was the matter of the two ridiculous Technical Foul calls on Kendrick Perkins by referee Ed F. Rush that got the Celtics center ejected. The league has since rescinded one of them, although even the ESPN announcers agreed that both were illegitimate. The saddest part of all of this is that the Orlando Magic may well have won the game without all of the blatant favoritism from the referees. They shot the ball incredibly well from 3-point range and generally played a solid game. I’d prefer to be able to give the Magic the credit they deserve for persevering, but it is awful hard to do that when the officials are overshadowing the play on the court. The NBA has an image problem with it’s officiating, and unless and until they take real steps to address it, that will continue. Sweeping it under the rug by fining anyone who dares say anything will never solve the problem. The bedrock of good officiating is being impartial, and it’s pretty hard after a game like last night to really buy the idea that NBA referees are particularly impartial. I really wish I could. Why we should all be rooting for the Boston Celtics to win the NBA Championship. Let’s start with the obvious disclaimer that I’m a Celtics fan and I can’t stand the Los Angeles Lakers or Kobe Bryant. With that out of the way, let me explain why I think that the vast majority of basketball fans should be rooting for the Boston Celtics to win the NBA Championship this post season. If you’re a fan of one of the other three teams still remaining, you’re excused. We can all appreciate loyalty. Otherwise, your rooting interest should go to the Celtics for one very simple reason: Team. The NBA has long pushed individual superstars. Whether it be Wilt, Magic, Bird, Michael, Kobe, or LeBron, the NBA has marketed individual greatness. It has ridden the back of individual superstars and turned them into marketing icons. For myself and I suspect at least some others, that emphasis on the individual has become a turn off – a gross and crass exuberance for the celebration of the selfish. Kobe Bryant and the media’s “LeBron Sweepstakes” obsession are the pinnacle of this trend. As great as Magic, Larry, and Michael were individually, the best thing about them was the way they helped spur their teams on to the greatest heights. Michael Jordan made Bill Wennington and an aging Bill Cartwright look like integral parts of championship teams. Kobe Bryant needed the individual skills of Shaq or Pau Gasol to help him win a championship. I actually hear complaints from Laker fans when Kobe doesn’t take enough shots. Wow. Frankly, I’m sick of hearing about the “Black Mamba” and LeBron, and to my eyes, the Boston Celtics look like the antidote to a basketball culture that’s become all about “me.” The Celtics are so fun to watch right now because more than any other team they are winning by their combined talents. They buried LeBron James and the Cavaliers not with individually great performances (although Rajon Rondo’s impressive triple-double was just that), but by working together. To watch the Celtics pass the ball when their offense is running on all cylinders is a thing of beauty. You can keep Kobe, L.A. I’d rather have a team anyway.